Noon in a forest not far from Stormgaard, three adventurers, two elves and a human woman, watched a partly obscured cave entrance. Although a path led up to the cave, they weren’t on it. The normal buzz of a forest at noon helped hide their whispered conversation. Insects whirred, birds chirped, leaves rustled—an ordinary day. The three women dressed in forest colors, light green and brown. They wore light gloves, boots, leggings, blouses. 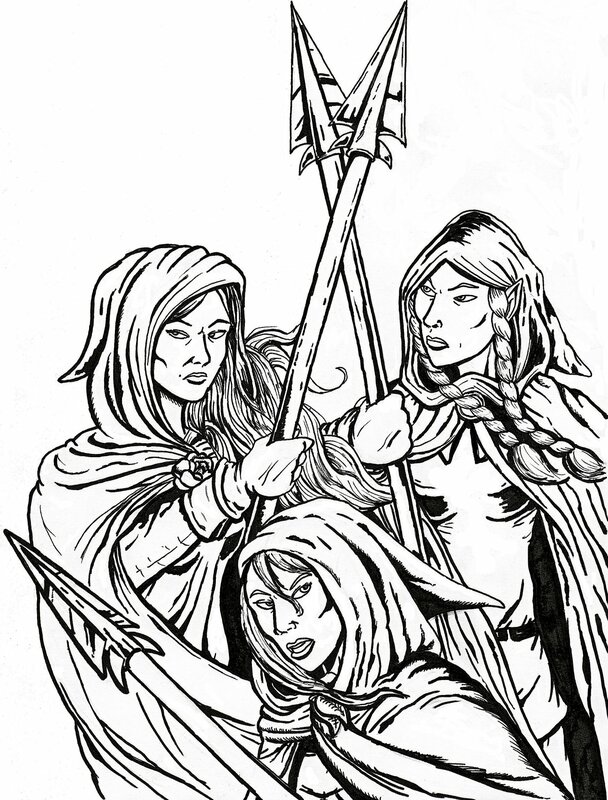 The elven women carried knives and spears with blades made of silver. They both had a kind of unearthly beauty, but one, the High Elf, was tall and flame-haired, while the other, the Forest Elf, was short and dark-haired. Green cowls covered their pointed ears. Except for the lack of bows and arrows, they could have all been foresters. “Barrooooooooo khazaaaad!” The war cry of a Dwarf in battle split the air. Birds took flight. Calyx and Petal drew their daggers and tensed to charge. Rose drew her falcate, a short curved sword made of the same silvery metal. When she hunted with elves she couldn’t very well use mortal iron or steel. “Now?” Petal could barely restrain herself from charging into the cave. Inside the cave three creatures from nightmare brandished flint-headed tomahawks and advanced upon the Dwarf warrior. Light came distantly from the opening behind her, but mostly from the gleaming cap she wore—a dwarf mining cap with glowstone set into the metal. The goblins were nearly as big as the Dwarf, but seemed like savages in comparison. Their warty green skins were naked save for a few belts around the waist and over the shoulders. Their large yellow eyes gleamed with reflected light. Their cruel, overhanging teeth champed and gnashed. They spewed curses in the goblin language at their adversary. They spread out to attack from three sides, being very careful to stay out of range of the double-bladed great axe that the Dwarf woman wielded so deftly. The goblins edged closer in half steps, ever ready to jump back or dodge away if the Dwarf swung her deadly axe at them. They watched for their moment to attack. The Dwarf was well armored, but one cut from a poisoned tomahawk could bring her down. Thorn thought about voicing the second call that would her comrades to her aid, but there were only three foes. Her honor demanded more of a challenge. The goblins thought they were so clever, coming from three angles, but they were in a cave and didn’t really have that much room to maneuver. One goblin feinted a cut with his tomahawk, knowing it would bring a counter-swing of the Dwarven axe, and jumped back to be out of range. His two companions charged forward from both sides, hewing with their stone weapons. But Thorn was wise in the trickery of goblins. She did not counter swing at the feint, thus leaving herself open on the sides. She charged, as fast as she could go. In a second she closed the distance on the backpedaling goblin. 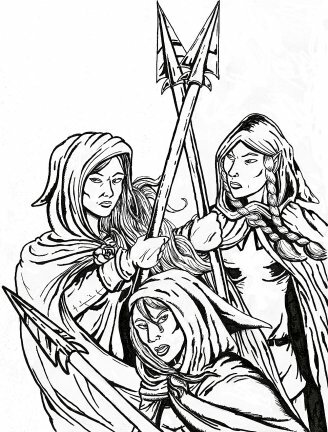 The other two who had thought to flank her found themselves overshooting the mark as Thorn flashed between them. Her mighty axe swung low as she advanced on her foe. The goblin got his arm and his stone hatchet in the way, but it might as well have been air. Keen Dwarven steel cut through the wooden haft like it wasn’t there. The falling hatchet blade glanced off Thorn’s armor and fell to the floor. A moment later the two halves of the bisected goblin joined it. With one foe down, Thorn whirled to her right. The other two goblins were just turning to face her when she hurled her war axe at the one on the left. He shrieked and died as the long spike on the end of it tore through his chest. The third goblin panicked. “Spawn brothers, help me!” He turned and dashed for the cave mouth, hoping only to escape the Dwarven demon that had just slain his two companions. Thorn ran to recover her axe. From the deeper darkness to the rear of the cave came many shouts and howls and the flapping of webbed feet on a stony floor, and a stream of goblins barreled into the room with her. She put one foot on the corpse of the impaled goblin and yanked her axe free of the body. Goblin blood spurted out of the hole where the spike had been, but it did not sully Thorn’s armor. Without a moment to lose, she launched herself into the Dwarven death spin, axe held out straight to the side as she whirled faster and faster. Rose, Calyx, and Petal charged the cave mouth. Just as they reached it, a goblin burst into the open, still looking back over his shoulder. Petal jabbed her spear into its unguarded stomach, impaled it, and with a deft heave, lifted and threw the green-skinned creature over her shoulder. With a twist of her wrists she withdrew the sleek spearhead from the innards of the flying goblin. The goblin had time for one last shriek as it burst into elvish fire. The charred body was dead before it hit the ground behind them. Inside the cave Thorn whirled, and everything that hit her blade died or was badly chopped. Goblin parts flew in all directions. Stone hatchet blades clanged and rebounded from her coat of Dwarven mail and the stout leather jacket atop it. There were so many impacts. Thorn felt herself slowing, and knew that if she stopped, a poisoned tomahawk or flint knife might well find her. Then her friends arrived. For just a moment the goblins were so focused on the death-dealing dwarf that they didn’t notice the arrival of two elves and a human woman. In that moment six of them died, impaled on sharp spears, or cut by flashing blade. Where the elven weapons struck goblin flesh burst into a white mystic flame. The elves scarcely felt the magic fire, but to the goblins it was deadly. And the slaughter continued. The elves danced through the melee like leaves in a tornado. Where their spear points cut or impaled the green-skinned monsters, goblins burst into flame and died. The human woman did not have quite their grace, but she moved with her own economy of motion. She chopped at goblin arms and legs, crippling them, and burning them, and keeping her blade always free. Made from the same silvery metal as the elven spear blades, it also caused the goblins to burst into flame when it touched them, but since she was human, the fire did not last as long or burn as fiercely. In slightly more than a minute the fight was finished. Twenty-three dead goblins littered the cavern floor. One or two had fled into the deeper darkness at the back of the cave. Thorn leaned on her axe, breathing heavily. Her armor was spattered with goblin blood, greenish black in the dim light of the cave. She saw the others looking at her with expressions of curiosity and concern. “Are you alright?” Rose knew that if even one cut from a goblin weapon got through, her comrade could be in serious danger. “Are we going all the way into their lair?” Distaste marred Petal’s pretty face. As usual, the elves skipped out, leaving the dirty work of beheading corpses to the human and the dwarf. Rose grabbed a long pointy goblin ear, pulled the head up, and chopped through the scrawny neck with a deft swing of her sword. The elves returned in a few minutes with the bags. Rose indicated a growing pile of heads and turned to decapitate another goblin body. “They might say the same about Dwarves,” countered Rose. “What else did you see?” asked Rose. “But were the Goblins good for anything at all?” asked Thorn. Calyx winked at Rose and Petal, turning her head just enough so that Thorn wouldn’t see it. “Yes, and there were even some Dwarves paying good money to listen to that Goblin minstrel,” Calyx claimed. “Have I ever lied to you, Thorny?” Honey practically dripped from Calyx’s tongue as she batted her eyelashes at the blood-smeared Dwarf. In half an hour the work was done, and the four comrades, each carrying three loaded bags, set off down the forest trail. Some time later the path intersected the Forest Road, and an hour later they came out of the trees and saw the walls and towers of Stormgaard.